We are one of the largest supplies of electronic insect killer machines in the Northern Ireland, and are the head distributor of Brandenburg / b-one equipment and can offer the most competitive price. 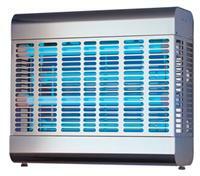 We have a wide range of electronic insect killer machines to suit most premises and budgets. Glue boards can be used in food preparation areas where traditional electric killers cannot. Where with an electric fly killer the fly can be burnt, or vaporized which poses a hygiene risk, with a glue board killer the fly is solidly stuck to the board, which is then simply removed and replaced when full. Genus® Discreet: Silent Safe Effective Insect Control. Discreet incorporates the latest translucent technology to ensure a discreet fly catch. Genus® Discreet has been designed to be used in sensitive places, such as bars, restaurants, receptions and public places where it will offer safe and silent insect control. Genus® Discreet allows insect control units to be used in areas where both public image and hygiene are important. Genus® Discreet works using proven UVa light to attract insects and specially formulated glue boards to ensure safe, fast and effective insect entrapment. Extensive research has shown that both shape and colour determine the number of insects attracted. The results of this research have been incorporated within the Genus® Discreet design to ensure optimum performance. In addition, the Genus® Discreet lens cover uses patented Translucent Technology™ to attain the highest possible performance levels. Translucent Technology™ is the result of years of effort to develop a lens system that will collect and refract the UV light. This in turn enhances the total emission efficiency, which is the essence of high catch rate. The specially formulated (465 sq cm 72 sq inch) control boards ensure fast effective insect entrapment and are completely hidden from view. They can be changed quickly and easily. Genus® Discreet incorporates the latest design innovations alongside the best-proven technology to create a product, which is uniquely different and highly effective. Brandenburg developed Genus® VIPER™II to offer insect control for commercial premises, which require efficient products at a competitive price. The Genus® VIPER™II range has been designed and built to the highest standards and all units carry international safety certification. All models are fitted with two 15 Watt UVa lamps, which ensure optimum attraction to flying insects. Once attracted to the unit the insect is hygienically and securely trapped onto a glue board or in the case of the high voltage model, electrocuted and safely collected in the deep catch tray. The Genus® VIPER™II has been made easier to service, can be either wall mounted, suspended or free standing and is available as a high voltage killer or catcher unit with an IEC or *Hard-wired connection upon request. The Genus® Liberator™ is a range of insect control systems specifically designed to offer insect control for food processing applications. The development of this range focused upon excellent design and quality with the primary emphasis placed upon achieving optimum performance and maximum reliability. All products are certified to meet worldwide safety regulations. The Genus® Liberator is one of the quickest and easy to service insect light traps on the market. The units are very economical to run, are available in either white or stainless steel, and can be both wall mounted or suspended. Additionally the units are available with jet proof options for use in the toughest environments. 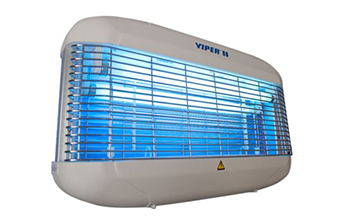 The insects are attracted to the unit by 4 x 15w UV-A lamps. Here the insects become permanently trapped on a specially formulated glue board or alternatively the insect comes into contact with the high voltage grid, is electrocuted, and falls safely into the deep catchment tray. Robust product, designed and engineered for the toughest environments. High UV output and insect attraction from 4x 15 Watt UVA lamps. Tool free servicing and maintenance. Each unit offers the convenience of two mounting options – suspended from the ceiling or mounted on the wall. Large Catch/Kill area provided by the High Voltage Killing Grid. Certified to meet worldwide safety regulations. Genus® Cobra has been designed and developed to enable us to offer the most efficient glue board insect control system available. The NEW & INNOVATIVE translucent technology incorporated in the Genus® Cobra™ enhances the UV light intensity compared to similar types of units. This unique UV dispersing technology allows the light to shine from the front, top and sides covering large areas and thus increasing the fly catch – even for small flies. Our extensive research has identified that shape and colour as well as light output, influences the number of insects attracted. The Genus® Cobra™ design includes all of these features. In addition, the unit is fitted with a UV light reflecting louvre panel behind the tubes to further enhance the output. The louvre also provides the further benefit of hiding the insects from view and provides discreet insect control for public sensitive areas. The two specially formulated control boards ensure that once inside the insects are permanently trapped. The Genus® Cobra™ glue boards have a huge 1400 sq cms (216 sq ins.) of insect retaining area which can be changed both quickly and easily. The large insect retaining area makes it ideal for heavily infested premises, as it needs to be replaced less frequently. During independent testing Genus® Cobra™ Translucent Technology™ has proved to be the most effective product within its class and has consistently outperformed other units with more than twice the light output. 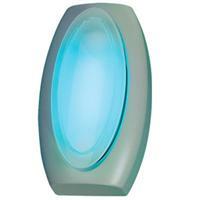 Genus® Cobra™ can be supplied in 30W or 45W variants with either translucent or grey covers.